We went up this morning in the rain to spend the day at the fair. In addition to all the canned goods I entered, I decided to make cupcakes to enter in the baking competition. 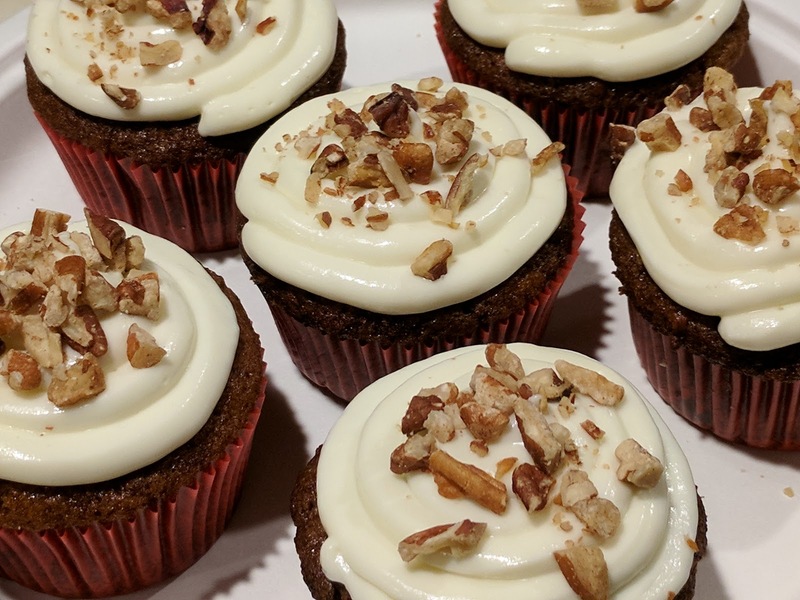 I am on a carrot cake kick so I made carrot cake cupcakes. I had to enter a plate of 6 of them. When we got to the fair we immediately went to drop them off and check out the canned goods section. I did quite well, with first place for: soup, sauerkraut, and sweet relish. Second place for: the collection of three jellies (the ones with the wine that I banged out in a few hours the night before I had to take everything up), other pickled vegetable, Concord grape jelly and apple jelly. Third place for the strawberry jalapeño jam. Honorable mentions for: wild blueberry jam and ginger peach jam. Only three entries did not place: salsa, mulberry jelly, and apricot ginger jam. 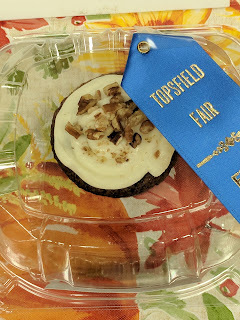 We wandered around the fair for a few hours while we waited for the cupcake judging. We checked out the rabbits, cows, pigs, sheep, and goats. I got nose-booped by a calf named Bella. We watched a little bit of the junior cattle show and visited the beekeepers exhibits. I held a 1-2 day old chick. Ate a bunch of fair food, ran into a few people we knew and shared a table with a few we didn't (but know now!). And we got back in time to watch them judge the cupcakes. We felt it was a very good sign that one of the two judges didn't want to give up the plate with my cupcake on it! And, at then end, I'd won first place! Now I'm home, working on a beet and goat cheese tart for dinner with friends. And there are more of those prizewinning carrot cake cupcakes for dessert!